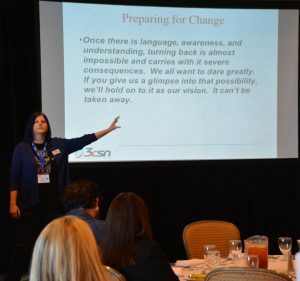 On Friday, April 20th, participants from across the state convened for LINKS 2018: The Fierce Urgency of Now: Preparing for Change at the Crowne Plaza Hotel in Ventura. Deborah Harrington, 3CSN Executive Director and Dean of Student Success at the Los Angeles Community College District, set the tone with a powerful welcome message. 3CSN Coordinators Erik Armstrong and Kyle Hull then facilitated an activity, Simplexity: Visualizing Leadership Frameworks. 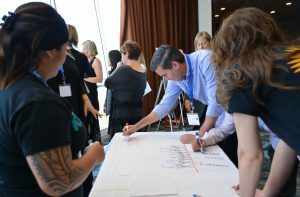 Participants were first asked to define what leadership meant to them, completed a shared reading of Eric Klein’s “Is Real Change Possible,” and then created posters representing their “simplexity” framework. 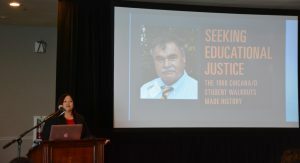 Dr. Cynthia Olivo, Vice President of Student Services at Pasadena City College, was the plenary speaker for the day. 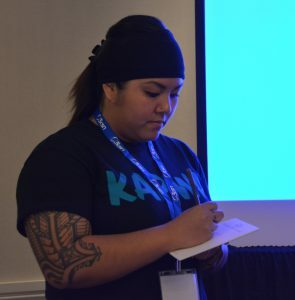 In her presentation, “Creating Community & Responding to the Urgency for Change in Community Colleges,” she shared Dr. Martin Luther King’s speech as well as the story of Sam, a PCC graduate, to contextualize the urgency for change in the community colleges. She then told her inspiring personal leadership story and defined the fundamentals of transformational leadership. Implementing changes that last and moving the needle on Student Success is challenging yet necessary work. Come and learn about what to focus on and how to implement large scale changes to increase student equity & success and student sense of belonging. Attendees will hear a brief summary of changes that helped PCC go from #600 community college in the nation to Top 10 according to the Aspen Prize for Community College Excellence–in a three year period. How did this happen? Collaboration across Student Services & Instruction, evaluating efforts and making adjustments, engaging faculty, staff and administrators across the college, incorporating the student voice, and providing collegewide professional learning–all with a focus on becoming equity minded practitioners. What should you do first? How do you get it done? Come and learn some strategies, share your stories and feel strengthened in your journey to increase student equity and success. This interactive session will highlight best practices incorporated into the development of Mission College’s Integrated Plan such as mindfulness, student engagement, cross-functional inquiry and the importance of self-care and compassion in building community and capacity for change. This session is co-facilitated by a Mission college alumna and a faculty member who will share their experiences and insights into how Mission worked to cultivate campus wide engagement in equitizing our change process, including how our process has been guided and supported by the college’s Equity Framework. Join our session as we share about the evolution of Professional Learning at West Los Angeles College. 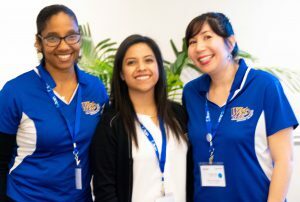 Our process has expanded from the Senate’s annual Flex Day, our Tech Fair workshop series, Focused Inquiry Groups (FIGs), and sending faculty to select conferences to building a Professional Learning (PL) Hub at West starting in 2017. Our PL Hub currently consists of a dean, a coordinator, and six faculty trainers collaboratively leading twenty-five mentees with a focus on specific instructional methodologies including Acceleration-AB705, Culturally Responsive Teaching & Learning, Growth Mindset, Habits of Mind, Just-in-Time Teaching & Remediation, and Reading Apprenticeship; our PL Hub faculty trainers and mentees combined will implement their instructional methodologies in nearly 80 courses this spring. This session will be interactive as we walk through a timeline of where we started, where we are now, and where we plan to be in the upcoming years and hear from participants about professional learning at your colleges. The day concluded with a cocktail reception immediately following the closing comments/reflection.